Der Artikel Georg Kulenkampff - Milestones of a Legend wurde in den Warenkorb gelegt. 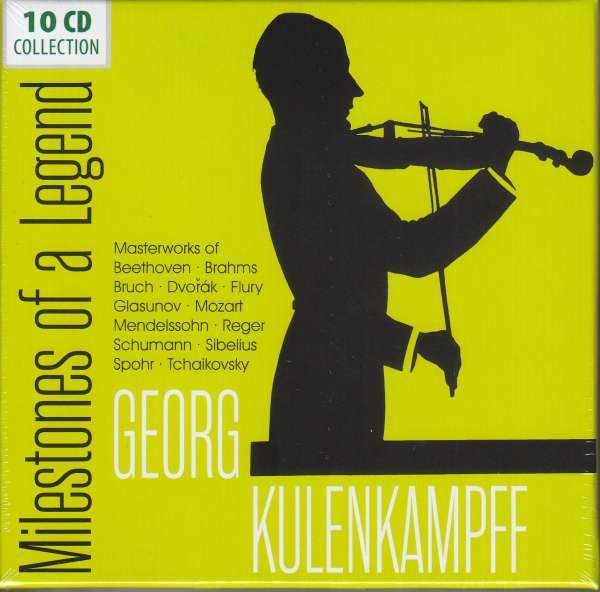 Georg Kulenkampff (* 1898 in Bremen, + 1948 in Schaffhausen) made music history, when he performed the premiere of Robert Schumann's violin concerto. Clara Schumann had put a one-hundred-year ban on the piece, as the composer's mental illness was supposedly apparent in this work. The great violinist Joseph Joachim, to whom the concert was dedicated, thought it difficult to play. It was only in 1937 that the first premiere in Berlin was made possible by an agreement with Schumannʼs heirs. The conductor was Karl Böhm. As Kulenkampff and Böhm were under contract with competing companies, Hans Schmidt-Isserstedt took over the direction of the Berliner Philharmoniker for the recording. But also the German premiere of the Sibelius concert - under Furtwängler - and the premiere of the Flury concert are included in this 10-CD-documentation, which presents the first general overview on the art of this important German violinist. Kulenkampff died of virus encephalitis after an injection with a poorly disinfected syringe at not even fifty years of age.